Not just another funk/world/rock/jazz/classical ensemble, Eclectica is a virtuoso groove event. This genre-defying band features the 5 time Grammy Award–winning drumming of Roy "Futureman" Wooten, of Bela Fleck and the Flecktones and electric violin virtuoso Tracy Silverman, heralded by the BBC as “the greatest living exponent of the electric violin.” Bass legend Steve Forrest, (replacing Kyle Whalum), rounds out the ensemble. Eclectica weaves sound-pieces together with a groove that is alive from the first note to the last encore, with sing-along choruses and creative jams that can lead in any direction. With 3-part vocals and inspired synchronicity, Eclectica is a celebration and a concert on the same stage. Jim Beal Jr., writer for the San Antonio Express-News interviewed the band during a festival last year, and was able to get some fantastic insight into the creation of this unique trio. Beal writes, "When it comes to naming bands, truth in advertising does not always figure into the decision. For Nashville-based Eclectica, the name is on the mark. "What comes out of us is kind of funky rock, jazz and classical," said violinist Tracy Silverman. "There are elements of all those things in the music, which is why we call the band Eclectica." 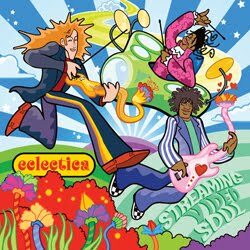 Eclectica began with Silverman, Wooten and bassist Kyle Whalum (currently on the road with James Otto) and recorded their debut CD, "Streaming Video Soul" (Gutbucket Records). Forrest is Eclectica's current bassist, replacing Whalum for their recent tours. There are some great tunes on this album, including my personal favorite "Nawlins". There is an amazing live video of Eclectica performing this song with an orchestra that must be seen to be believed. "I think people have open minds and ears when it comes to music," Silverman said. "I think people would rather hear more than one style of music. And, we don't want to get bored. We like to jump around. We have eclectic backgrounds. The music business tends to be very restrictive for artists. If you have a hit, you get labeled as that for the rest of your career. It's good for marketers, but not for artists." Beal continued with a bio of the band, "Eclectica is not about to get labeled, at least not easily. Silverman grew up in New York. He started playing violin at 4. By the time he was 8, he was in the Juilliard School pre-college. He started winning competitions at 12 and graduated from Juilliard at 20. In 1994, he moved to the San Francisco Bay Area and joined the Turtle Island String Quartet. In the early 2000, Silverman started collaborating with contemporary classical composer John Adams, who composed the electric violin concerto "The Dharma at Big Sur" for the violinist. Wooten is an inventor, composer and percussionist. With the Flecktones, he performs with a customized electric guitar-synthesizer, "The Synthaxe" which he renamed, the "Drumitar". Wooten also fronts the orchestral "Black Mozart Ensemble". With Eclectica, Wooten plays acoustic drums. Bassist Forrest, from Nashville by way of Memphis, is a first-call musician who has worked with Tony Joe White, Lucinda Williams and Emmylou Harris as well as with jazz bands and the Wooten Brothers and Friends group." "Me and Roy bumped into each other a few times. He asked me to play on some of his projects. He's always doing something interesting," Silverman said. "I had this vision of a band with me, Roy and a keyboard player. It evolved into Eclectica. We decided to make a record and see if anybody would book us." Recording for Eclectica is not much different from playing live. "We recorded live, like we were jamming, to try to maintain that feeling," Silverman said. "I think we did well in the studio because we like to give ourselves some freedom. Live, we approach the music more like jazz players. We leave things open-ended. That makes every night different." Something else that's different is Silverman's violin. It's a six-string instrument made by luthier Danny Ferrington. "It's tuned in fifths and has two lower strings," Silverman said. "It actually changes everything. I can play chords. And I developed a technique I call 'strum bowing.' I also use a strap and play the violin kind of like a guitar." With Eclectica, vocals also figure in, but not necessarily vocals in the traditional sense. "My original intent was for vocals to be about 50 percent of the time," he said. "It's primarily an instrumental band, but I think solely instrumental bands can be kind of boring. The vocals give us a little different texture..."
Eclectica hasn't appeared much on the west coast, confining their performances to Nashville and the east. I'd keep an eye out for this lovely trio; Silverman is amazing on electric violin, both Whalum and Forrest bring the funk and it's a real treat to hear and see Futureman on a tiny acoustic kit, tastily using wooden brushes and crisp cymbal work. More drummers should take his softer, yet confident approach. Meantime, pick up a copy of "Streaming Video Soul", a fine blend of jam-band-meets-Hendrix from three musical virtuosos.